We chose this cruise for my husband to experience the Panama Canal . Don’t expect to much of anything on this ship very poor in so many areas and ways P&O have really dropped their standards. 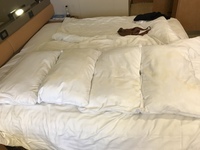 Dated cabins with dirty stained sweaty pillows threaded quilt covers dirty shower curtain that wasn’t changed for the duration of our 24 day cruise, unhelpful rude reception staff ( females mainly) dirty ripped chair covers on the furniture ( horizon pool ) are only a few of our many disappointments and concerns for others planning to sail on this ship. The restaurant and waiting staff were very polite helpful and friendly however freedom dining doesn’t exist as even although we booked this dining we were revived a pager for each meal. This cruise was an expensive mistake however a lesson learned. I’m really not someone who normally writes reviews however If this saves even one other person parting with £6000 plus of their hard earned money then my time and review will be worth it. Think twice before booking this ship. Cabin was uninviting and dated. 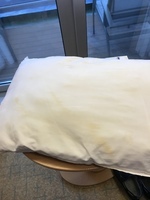 The bed was comfortable enough however the pillows were hard and uncomfortable So I decided to take my pillow case of to see the filling of my pillows I was absolutely disgusted to find yellow sweat stains on each of our pillows on the first night of our cruise ( supposed to be luxury I think not ?. The Quilt covers we’re threaded and past their sell by date thank goodness the towels were white and fluffy. The excuse I got for the pillows just ridiculous . 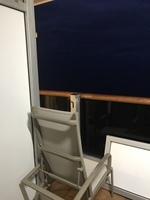 We also experienced problems with our balcony divider between our balcony and the one next to us. 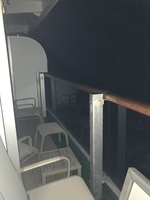 Staff actually took the panel off exposing both balconies to each other ( no privacy) and forget about private balcony they left the panel on its side against the glass in our balcony telling us that they would be back the next day to fix it. 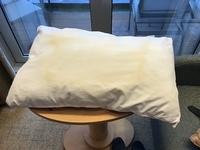 I Wes extremely unhappy and concerned about this matter and reported it to the reception staff who appeared uninterested until I mentioned the health and safety issues re this hence to say our panel was repaired that evening. 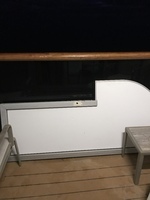 The curtain over our shower wasn’t changed for the duration of our cruise (24 days). We booked for freedom dining however we received a pager for the duration of our cruise ( no point in booking freedom dining) . The food was cold and average in the Belvedere it was slightly better in the merridion restaurant however our most enjoyable meal was in the ocean grill. The restaurant staff were helpful and pleasant but unfortunately this cannot be said for the reception staff as the majority of them ( mainly female staff ) were unprofessional and rude. The captain was aloof with very poor presence. This cruise was disappointing in so many ways P&O have really dropped their standards and it will be a very long time ( if ever ) before I would consider using them again I’m sure my £6000 plus could have been spent more wisely . This has been a very expensive lesson learned . I could go on about many other unacceptable areas and issues of this ship however I really don’t know if it would/ will make a difference what I will say is don’t expect to much when cruising on this ship.